The farmer’s market is stocked with beautiful squashes and pumpkins this time of year. I bought this beautiful squash and got inspired to paint my kitchen the same color. This soup is low in points and is very filling. A perfect autumn meal. Enjoy! In a large heavy pot, combine squash, carrots, celery, onion, garlic, sage and broth and bring to a boil. Cover and simmer on low heat for about 40 minutes, until squash is tender. Discard the sage and using an immersion blender, puree the soup. Add milk and adjust the salt and pepper to taste and serve. Great topped with freshly grated Parmesan cheese. Using a large spoon scrape out the seeds and strings. 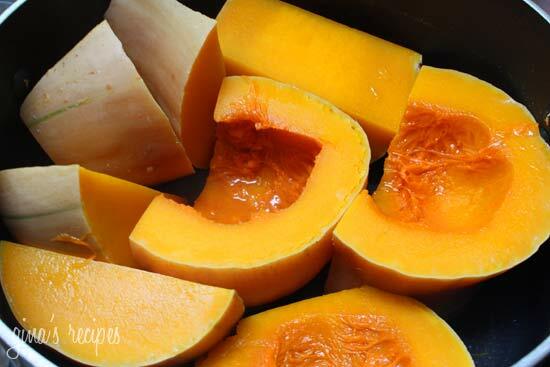 Cut the squash in large chunks and place in a pot of boiling water for 10 minutes. Drain and let the squash cool. The skin will come off easily with a pairing knife. Hi if I don’t have sage what do I do? Such a nice recipe. I precook mirepoix and keep a few bags in the freezer. I used one instead of the other veggies. So yummy. Thank you. So I’ve made this soup a few times and I’ve pretty much got it down to a science; add an apple for some sweetnness, chop everything up, throw it all in a pot with some butter or olive oil and sauté for a bit; add water and boil for about an hour; blend it up and yum! This recipe is simple, easy and the results are delicious. Thank you for sharing. Instead of 2% milk ? I made the soup with an apple. Chopped it with peel, and roasted it with the squash. Just added broth , infused it till it seemed the right consistency, It is what you like, Never did add the milk. Thanx , it is wonderful. Too heavy for a Thanksgiving dinner. It stands on its own as a an entree.Now to try your other goodies. I cut back on the broth–5 cups rather than 6, and the soup was still thinner that I wanted. Tasty, but I would decrease broth even more next time. I would make this soup a million more times! Absolutely delicious. The ONLY nitpick I have is that the carrot completely took over the flavor of the butternut (I roasted the squash instead of boiling) and I ended up having to add more butternut to get the flavor back. Otherwise, a beautiful recipe. 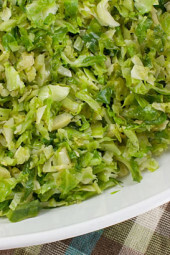 We are thinking of serving this over the holidays to our family of 9 as the main dish.. what would you recommend as sides? I’ve made the following changes to your recipe with delicious great success: I saute the onion, celery, carrot, and garlic in 1 tsp grape seed oil. I roast the squash at 425 degrees for 30 minutes. I purée the cook squash in my food processor. I add the puréed squash to the boiling stock/veggie pot and then blend it with an immersion blender. Instead of adding milk, I add 1/4 cup whipped Greek yogurt cream cheese! It melts nicely into the warm soup. The points stayed the same in WW recipe builder. Thank you for always providing healthy, affordable and easy to make recipes. Thank you! It's soooo good and even my non-veggie loving husband ate it and liked it! I usually have had thicker squash soup and it's so rich, just can't eat a whole bowl. Your recipe is thinner and still so flavorful – love the little sprinkle of fresh parm on top ! And it's especaially good on a cold winter day like today! Love your recipes. Thanks Gina! I just made this recipe and I think it is so bland. I added 1/2 tsp ground pepper and 1 1/2 t salt. I even sautéed the vegetables in 1 t of olive oil to bring out those flavors. Everything else is the same. I don't get how everyone says it's so delicious. I have your Skinnytaste cookbook and have made multiple recipes out of it and they were all fantastic. I don't know what went wrong. We find the original recipe very bland as written as well. We cut the chicken broth in half or double all the vegetables and that makes it perfect! Only one problem with this recipe: when it says to check for seasonings you MUST stop eating it right out of the pot or there will soon be none left. Another Skinnytaste winner/keeper! This soup is delicious. I was poking around your website on Sunday, now that fall is here, for some tummy-warming recipes. This was absolutely delicious. Thick, velvety texture and chock-full of flavor. Definitely going to be a "to go" recipe this fall (and the fact that it has so few calories!!). It doesn't get any better 🙂 Thank you!! I have found the serrated peeler from Pampered Chef makes peeling butternut squash a breeze and less time consuming then boiling it. Loved it!! 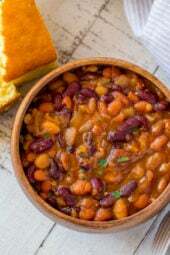 This is my favorite soup n ur recipe is delicious!!! Thanks!!! 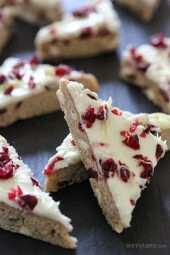 I just discovered your site a few days ago and made your pumpkin bars yummy. This looks delicious but have a question , are you familiar with pineapple sage, if so think the would work in place of regular sage? I have a big P-Sage in the garden but none of the other fresh nor dry. Thanks. Ok, I just googled and found that pineapple sage is from the mint family and can be used in a lot of different ways but not in place of regular sage. Is there a different herb that would be a good stand in for sage? I have fresh basil and parsley on hand and a few dry herbs so what is recommended? Thanks. Well, I am new at this. I am not on a diet but we have butternut and other squashes here in Botswana so will try this one and the Zucchini soup which is called baby marrow here. hope it turns out good! Love your site!! WOW!!! I decreased chicken stock by 2 cups and instead of milk, I added 1/2 cup fat-free half-and-half. This made it extra creamy and decadent. The parmesan cheese sprinkled on the top really made it! Amazing and so low in points!! Oh, also used 1/2 teaspoon dried sage because we're in the middle of a blizzard and couldn't go buy fresh. Wonderful! Has anyone tried this with coconut milk instead of real milk? I still want it to be creamy but want to serve it to friends who don't eat dairy…Thinking it could be good with some coconut milk or rice milk, and then an apple or applesauce? This is an absolutely fabulous soup – I love your website – I have lost so much weight and I eat delish food thanks to you !!!! I used 2 cups of bought pre-cut squash and followed the directions accordingly but I must have messed up somewhere because I ended up with only about 4 cups o soup… I'm wondering if it's because I used the pre-cut squash and it seemed like too little squash? Otherwise, the soup was awesome! I roasted some butternut squash pieces and put the whole pieces in the creamy soup and also added cumin. YUM. Gina, can I double the ingredients to make double the amount? 6 servings won't be enough for my family. I can't believe I never knew how to peel a squash easily. I make butternut squash soup all the time and am always afraid I am going to cut my finger off. Thank you for the tip. No pun intended. Get it? Finger tip? Love this recipe have made it 3 times already. I do add more sage to the soup and some pepper just a preference. 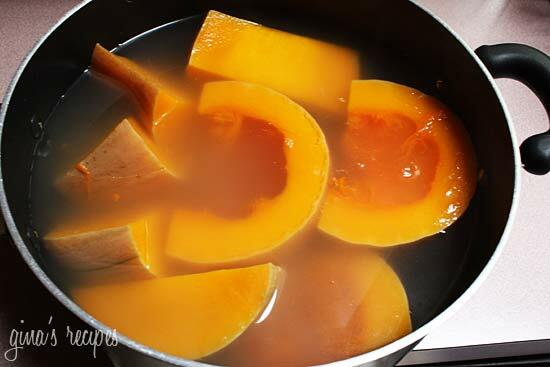 I also prefer a thicker soup so I add some canned pumpkin at the end if it is too thin. Everyone loves this and it freezes well too! This was awesome! I couldn't stop eating it! Other comments were right, don't even need the milk. And thanks for the tip on peeling the squash. Gina, I love your recipes. I recently made this soup and found it a bit thin so I omitted the milk. I had fresh kale on hand and added it and blended it into the soup and it was fabulous. I kept the rest of the recipe as written. I make your recipes several times a week and they have helped me maintain my 53 pound weight loss. Thank you! Gina, I love your site. You have amazing recipes. They are so delicious and easy to make. I made the baby greens, goat cheese and beet salad last night. my husband loved it. Itwas a trial run as we are having his whole family for Thanksgiving. I wanted to make the soup too, but do you know how long it would keep in the fridge or would it freeze? what do you recommend? Also, do you know how long cook beets will last in the fridge for that salad? I'm anxiously awaiting your cookbook! I hope you have lots of pictures in there as I need pictures!! Your photography is wonderful and helpful. Thanks for sharing your talent with all of us. My market must have giant squash! After peeling and chopping, I had six cups. I used four cups in the soup and roasted the other two. Ended up using the roasted squash as a garnish in the yummy soup. I took some of the other reviewers suggestions and added a smidgen of cinnamon; a dash of nutmeg; some grains of paradise and a few sprigs of thyme…and a half dash of red pepper flakes. Since I doubled the squash in the puree, it was quite creamy. My husband and I loved it. I'm a big fan of this site and recommend it to all my friends who cook. I just tried this recipe and I loved it. I had to omit the celery because I didn't have any and I added a few mushrooms to make up for it. It is the perfect soup to enjoy on this unusually chilly day in Missouri for this time of year! I absolutely love your site. I've made this soup several times and my husband just raves about it. I have never found a recipe yet on your site that hasn't been fabulous. I also like the colorful pictures and clear, concise directions. Thank you so much. 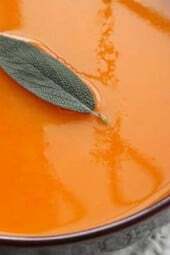 I didn't puree this soup; I pulsed just enough to get rid of the stringy texture of the squash. I only used 4 cups of broth for a thicker consistency. I also added some crushed red pepper flakes to add some heat. This recipe is delicious and surprisingly filling! Loved this one! Thanks Gina. Freezing leftovers (made double batch) so I have this goodie on hand for later. Thanks for everything you do on this site and your wonderful recipes. I have lost 17 pounds since the beginning of March and the Family STILL loves all of our meals when I cook my "diet" food. Hi there, was wondering, can I freeze? HOw long does it keep in the fridge? Can I make this in my crock pot? This soup is delicious!!!! Delightfully creamy and filling!!! Thanks for sharing! This is one of my favorite soups to order when I see it on a menu at a restaurant!!!! Thank you for creating a recipe simple enough to make on a weekday!!! I confess I bought the squash already cut up from my local Italian grocery but that was soley because I am lazy and clumsy with sharp instruments! I used only 4 cups broth- I like my soups a little on the thicker side! Another fantastic recipe Gina!!!! Delicious soup! Added one Granny Smith apple when sauteeing onion and used a bay leaf instead of sage. Roasted the halved squashed, spray cut sides with cooking spray place down on foil lined cookie sheet, roast at 400 for approx one hour or until soft and continue with recipe. Roasting really brings out the flavor! Hi Gina; I'm wondering if I could cook this soup in the pressure cooker to cut down on time? What do you think? 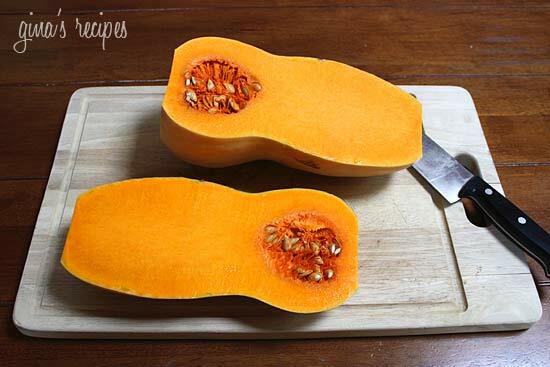 The easiest way to peel butternut squash is simply with a vegetable peeler. It's so easy! I am going to be making this tomorrow, I am so excited! I have never had butternut squash before…but squashes are all around me, so I am going to dig in! I calculated it on the new WW points, and it all depended on what item I picked for the squash to count as points…ie… it varied if I put in a medium squash vs. two cups of squash. I went with two cups as it allowed the recipe to be 1 point still. This was so delicious! My whole family loved it, including our 4 year old picky eating daughter. She had 2 bowls. I just made this today and wow, it is absolutely delicious! I doubled the recipe to use up a gigantic squash I got at the farmer's market. Perfect soup for fall. You could put it in the blender in small batches. Hi Gina, my name is Kelsey. I don't have an immersion blender, and I really want to make this for my mom. Is there any other way to puree the squash? Could I use beaters? We don't normally put milk in though as we find the squash has all the creaminess we need. Hi Susan, I see your point, I think a serving size should be 1 1/3 cups based on the ingredients listed. This is Super Yummy but I was wondering, should this make 12 cups total soup? If so, I think my measurements were off. This site is so great! The soup is wonderful and so is everything I've tried. Thank you so much for you work and recipes! Super yummy! Thanks for the recipe! This was the first time that I'd ever had butternut squash, so I was skeptical about what to do with it, and this was a great dish!!! I made this tonight to have on hand for quick lunch/dinners during the week, and it's delicious! I used reduced sodium FF chicken broth (only 4 cups instead of the 6 called for), and I used 1/4 c 2% milk and 1/4 c heavy cream instead of the 1% milk. Hubby stepped in and spiced the soup up with a dash of chipotle chile powder and paprika. After my modifications, a 1 cup serving is 2 Points+. I've made this soup several times now (just finished a double batch for the freezer!) and it is fantastic. Sometimes I add just a little cumin, oregano, and paprika to the pot, but that's only for a little variety. It's delicious as is! Thanks, Gina! I have been wanting to try this since I found this site and I finally got around to making it tonight. I tasted it after I thought I was done and was a little disappointing. I thought it was missing something. So I went back and reread the directions and realized I'd lift out the milk. And surprise, surprise, now it's perfect! I've enjoyed every recipe of yours that I've tried and this is another winner! Angela, would love to do it soon! Just did the calculations with the new weight watchers program and it is still 1 point per serving. This is so wonderful. Thanks for all the great recipes! When is your cookbook coming out? made this yesterday afternoon while supper was cooking. Had it for lunch with leftover corn salsa and wild rice – sooooooooooo yummy! Just made this and love it! I got the squash at Wegman's already cut up, Costco also carries it…makes it much easier to make! I only put int 4 cups of stock b/c that's all I had and I added about a 1/2cup of water. It was the perfect consistency. Thank you for another healthy, easy and delicious recipe! This was my first time cooking with butternut squash and I was really impressed with how delicious this was! My grocery store didn't have any fresh sage, so I substituted 1 tsp of dry. Do you think this is enough? I didn't taste it at all. But that may have been because I used more butternut squash than the recipe called for because I wanted to use it all up. The soup seemed really thin/watery. Is this the texture it's supposed to be? Yes, I'm curious to see how the new points will change. So happy you all enjoyed this. WOW! I just found your website, and I made this right away. What a bang for your buck! So good, and so filling. I have the Sloppy Joe's on the stove now – smells heavenly! Made this last week. It is delicious! I gave my mother-in-was some and she raved about it and can't wait to make it for herself. Making this tomorrow. I'm going to roast the squash tonight and have it prepared so that saves me time. Could I save more time doing crockpot? Looks good! 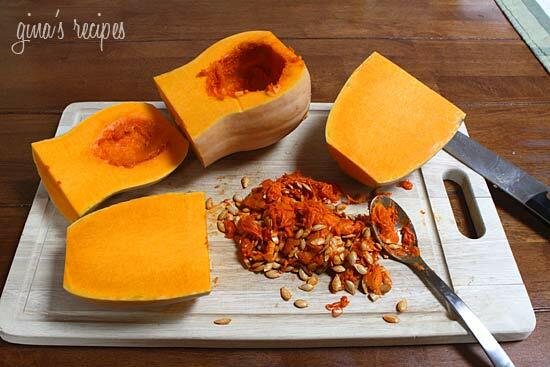 Easy way to manage butternut squash is to cut lengthwise, scoop out seeds, put cut side down on pan lined with foil, and bake until soft, 350 degrees for 20-30 minutes. Scoop out from skin shell and it's ready to use. Easy and messless! Of course you can oil or butter the cut side and season before baking if that works better for your recipe. omg, this soup is DEEELISH!!! It was sort of a beating to make as my knives are clearly not sharp enough to cut through raw butternut squash. I was nervous. But it smelled great while simmering and tastes even better. I added a dash of nutmeg and cinnamon for an even more "Fall" flavor. This made a TON of soup and was so easy! Gina, I made this last night! Tastes amazing, but question for you – Is it suppose to be more thick and creamy, or soupy? Mine was soupy, but I thought it was suppose to be a bit more hearty. I wondered the same thing. I just made it and I found it to be very soupy. One of the biggest problems I have with WW is that I'm a very picky eater and can never really find new and healthy recipes that I like. I LOVE this recipe. I just made it, tasted it, I sent the recipe to a bunch of friends and my parents. It's so good! I'm so excited to read through your site. Thank you!! Hi Gina – this soup is delicious! One question though, when I went to my online WW planner and put the recipe in, it said 2 points, and only because I upped the servings to eight. I figured even just by weight displacement the recipe had to be at least eight cups, not the six as the recipe says. It had the squash alone as 12 points, and 2.5 points for the veggie broth which I thought was odd since it is fat free. Any ideas on the discrepency in points? My WW leader explained the discrepancy when using recipe builder and it made sense, but I can't remember how to explain it. When I make a green smoothie my recipe builder tells me it's 7 points when it's really 0. Ask your WW leader! Your soup was a winner with my non WW family members. My 17 year old daughter asked is it still healthy if I have three bowls and I was honestly able to answer, Yes. Add an apple, saute, add fresh rosemary. add juice of one lemon, and about 1/2 cup of white wine. A few more points, but so good!!! Just tried this recipe. It is great. I made a few modifications. I cooked the squash overnight in my crockpot and then scooped out the pulp. I sauteed the onion, celery, garlic and grated carrot then added the squash and chicken broth. I did add one grated apple for flavor and did not use the milk. This is a great recipe. 1 tsp of dried sage is good if you can't find fresh. This soup looks delicious! I couldn't find sage leaves so could I use ground sage instead? If so, how much? Thanks! I like the idea of roasting great idea! I have made this soup both ways and roasting is 10th better. I buy two packages of the fresh precut butternut squash ( so worth the extra $2) roast at 400 degrees for twenty minutes and then make soup. Thanks for the recommendation, I will do it that way too! Yummy! 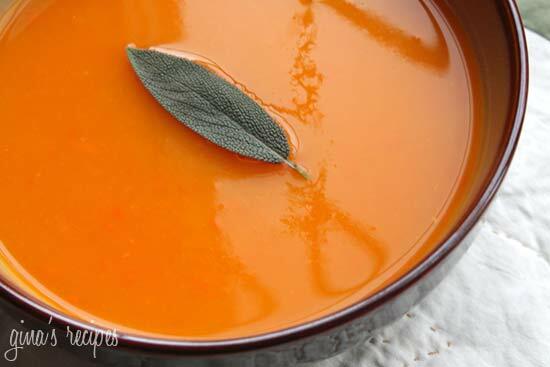 I changed things a little – sauted the onion, celery, garlic and carrot in 1 tsp of olive oil and roasted the squash instead of boiling it – added 4 sprigs of fresh thyme with the sage – didn't need the milk – great cream fall soup! Great Idea! I bet roasting the squash adds more flavor. Gina, I just stumbled across your site and it is wonderful! Have you tried making this with the frozen precooked squash? I have a package in the freezer and am considering it for tomorrow. Then, of course using it in your risotto! Hi Carol, yes, thank you, these photos are all shot by me. Gina, The pictures are great! Are you taking them? The soup looks and sounds wonderful.